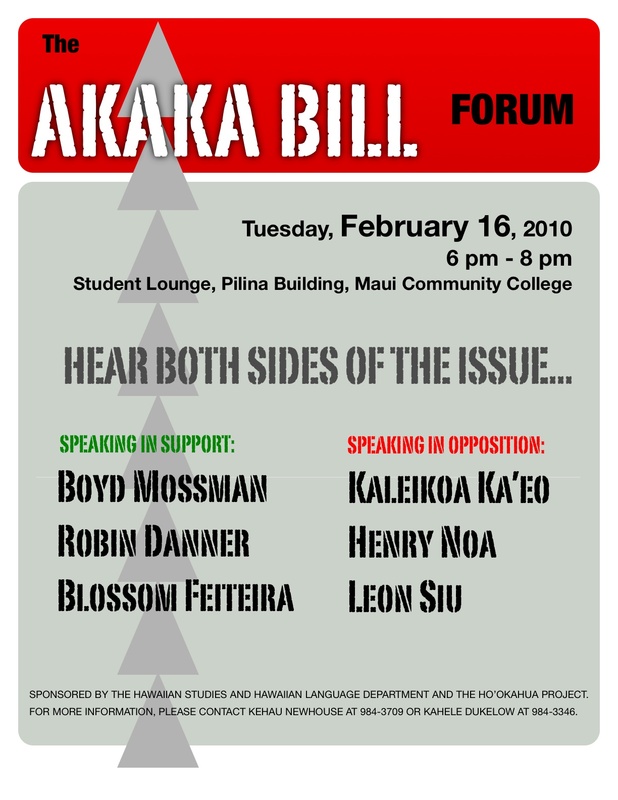 A Forum on the Akaka Bill will be held tonight, Tuesday, February 16, 2010, with speakers presenting both sides of the debate. 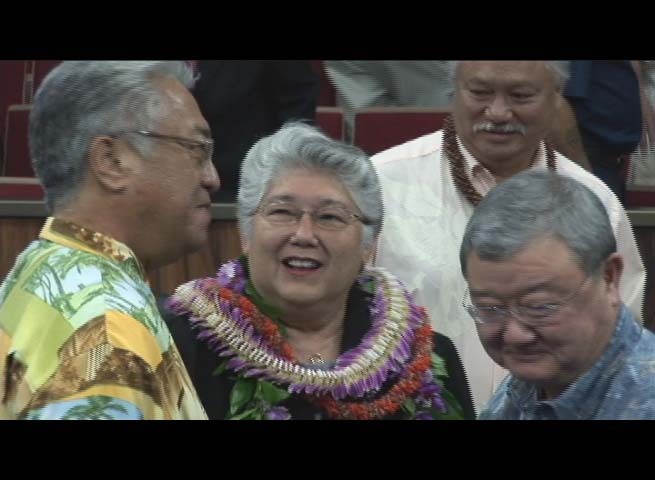 The bill was crafted to establish a process for Native Hawaiians to gain federal recognition. Flyer Courtesy: MCC Hawaiian Studies Dept. Speakers in support include Boyd Mossman, Robin Danner, and Blossom Feiteira; those against include Kaleikoa Ka’eo, Henry Noa and Leon Siu. The Akaka Bill forum runs from 6 to 8 tonight at the Student Lounge, Pilina Building at Maui Community College. The event is sponsored by the MCC Hawaiian Studies and Hawaiian Language Departments, as well as the Ho’okahua Project. 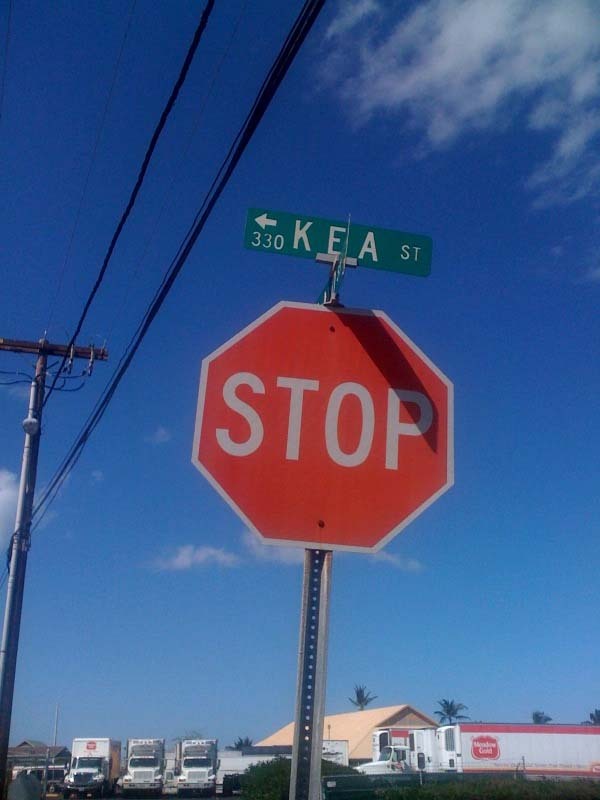 Maui County began work today on a sidewalk installation project on Kea Street in Kahului. The new sidewalk is being installed on Kea Street between Holua Street and Papa Avenue. The contract was awarded to Zoe Builders and is expected to be completed by February 26, 2010, barring any weather delays. Work will run from 8:30 a.m. to 3:00 p.m. Monday through Friday, excluding holidays. Motorists and pedestrians are advised to use alternate routes during the construction period. Those traveling through the area should expect delays, due to lane closures, and should use caution and observe all signs and traffic control personnel in the area. The 2009 EA SPORTS Maui Invitational basketball tournament hosted by Chaminade University, generated an estimated $6 million in visitor spending and revenue for Maui businesses. According to the latest data released by the Maui Visitor’s Bureau, the tournament welcomed thousands of out-of-state visitors, each spending an average of six days on Maui. Since its inception, the EA SPORTS Maui Invitational has generated more than $140 million for Maui’s economy. “The EA SPORTS Maui Invitational is an unbeatable marketing tool for the island of Maui,” said Chip Bahouth, general manager of The Sheraton Maui Resort & Spa. “It is an invaluable event for Ka’anapali and the entire island of Maui, because it brings the beauty and magic of Maui to millions of viewers. We are very fortunate to have such an iconic event and hope that it stays in Ka’anapali for many years to come,” said Bahouth. In 2009, the tournament was viewed by an estimated television audience of 4.4 million via the ESPN network. “The Tournament has been a part of Maui’s economic landscape for nearly 30 years,” said Tom Valdiserri, senior vice president of KemperSports, operator of the EA SPORTS Maui Invitational. “We were proud to partner closely with fantastic Maui businesses to support positive momentum in travel and tourism in the fourth quarter of 2009,” said Valdiserri. The 2010 EA SPORTS Maui Invitational will celebrate a powerhouse year as Connecticut, Kentucky, Michigan State, Oklahoma, Virginia, Washington, Wichita State and host Chaminade University of Honolulu vie for the coveted early-season title Nov. 22-24 at Maui’s Lahaina Civic Center. ESPN today announced it will air the season opening game of USC at Hawaii on Thursday, September 2nd. The game was included on the network’s 2010 college football schedule, and is also posted on the USC athletic department website. The game time has not yet been announced. A brush fire first reported at 12:54 p.m. Monday afternoon, February 15, 2010, near the Kula Agricultural Park north of Pulehu Road has burned an estimated 6 acres . No injuries are reported and no structures are reported damaged. Police closed Pulehu Road between Holopuni Road and Kulakula Road shortly before 2:00 p.m. Multiple fire crews and Air One responded to the brush fire in an area with gulches. The fire is reported to be diminishing but not yet under control. The cause of undetermined and remains under investigation. Forty-five Youth Conservation Corps members will participate in a day of service on Monday, February 15, 2010 to restore Maui’s Kanaha Pond in Kahului. The group will work to remove invasive plants, plat native species, and remove a fence to improve accessibility for future restoration efforts. Kanaha Pond is a 234-acre wetland adjacent to industrial buildings, commercial centers, and the Kahului Airport. The pond is home to three endangered Hawaiian birds: the Hawaiian coot (‘alae ke‘oke‘o), Hawaiian stilt (ae‘o), and Hawaiian duck (koloa). More than 80 species of migratory shorebirds, waterbirds, and ducks also frequent the pond. Native plants including makaloa and kaluha, species favored by Hawaiians for mat making, are also found at Kanaha. The Department of Land and Natural Resources (DLNR), Division of Forestry and Wildlife was awarded funding from the American Recovery and Reinvestment Act to engage the youth in protecting and preserving Hawai‘i’s natural and cultural resources as members of the Recovery Youth Conservation Corps. The Corporation for National and Community Service awarded the competitive funding to DLNR. In her fourth State Of The County Address today, Maui Mayor Charmaine Tavares challenged the state administration and the Legislature to examine other sources of revenue before cutting the counties share of income from the hotel room tax. Maui Mayor Charmaine Tavares, State of the County 2010. Photo by Wendy Osher. “Taking away the TAT revenue from the counties breaks a promise and shifts the tax burden for these costs from the visitors to local residents,” said Tavares. Tavares said, without the Transient Accommodation Tax revenues, the county’s shortfall will rise from $50 million to $70 million. Fellow Mayor Mufi Hannemann agreed with Tavares saying the counties at the end of the day are the key to the visitor industry. “You can do all the marketing in the world. But if people don’t feel that it’s safe to visit Maui, the Big Island, Kauai and Honolulu, they will not come. That’s what we do: we’re the home of the first responder, we fix the infrastructure, we maintain the parks, we’re there 24-7. So that’s a very important message that was said today,” said Hannemann. In addressing the county’s economic climate, Tavares said she wants no part of the layoffs seen at the state level. She said the options are simple: a combination of raising revenues and cutting spending. “In my mind, we must have a combination of those choices—reduce services and raise revenues—to find a balance that will enable us to keep our community strong,” said Tavares.